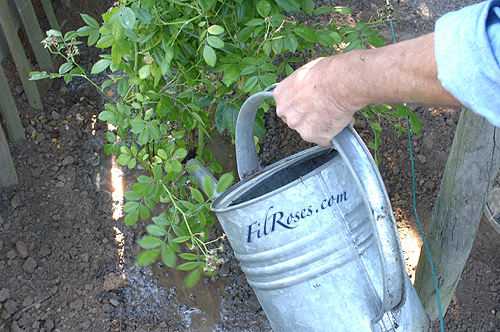 Prepare carefully planting because it is a milestone for the future of your rosebush. First choose a sunny location (6 hours of sun a day), it’s the first key to success although some varieties adapt to mid shade, this will always have a negative influence on the blossom. 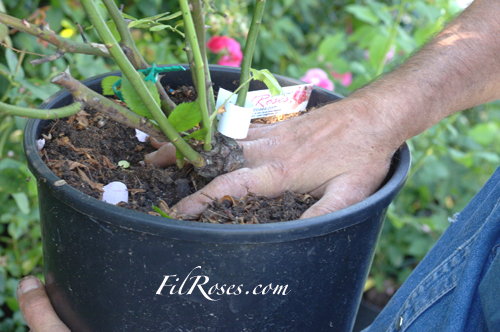 Whether you bought your roses in pots or bare root, planting method is similar, with a few variable details. If you follow our advice and your rose plant is healthy, the recovery is assured. A) The planting of rose plants bought in pots. 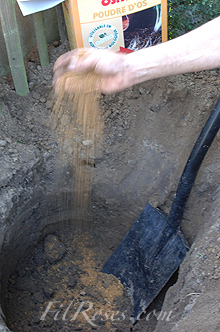 1) Spade deep soil, a hole of 70 cm deep and wide is ideal; remove the stones or any unwanted material. 2) Do not break the clump. Either you dip your pot in a bucket of water till overflowing, either you let dry the clump 2 to 3 days depending on the weather. Return the pot in a gesture that your specialist will show you (see illustrations). 3) Put the plant in your planting hole on a bed of loose soil to the point of graft (where the stems begin) is buried +/- 5 centimeters below ground level. This will allow a better anchor when violent winds come up and better resistance to heavy frost if you live in cold regions. 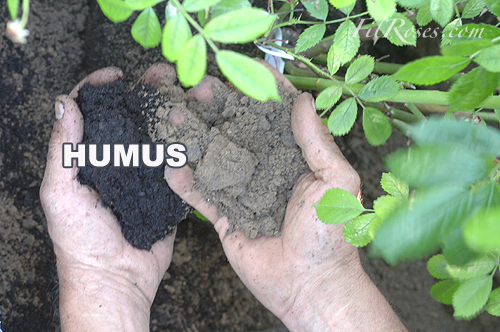 4) Add two to three kilos of humus to the backfilling ground while ensuring that this amendment of very rich ground is not in contact with the roots (risk of burns). 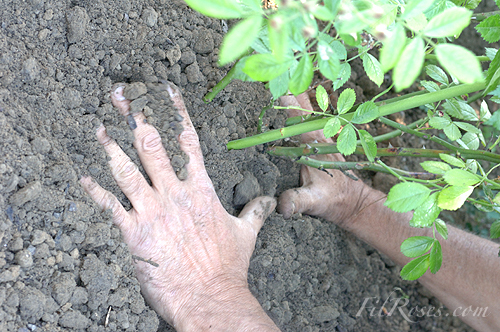 5) Add a handful of bone meal or fertilizer for rose plants. This will assure the rapid development of the roots. 6) Settle the soil around the rosebush and water copiously (10 liters of water at least). Note: If you plant in autumn, some varieties are a bit sensitive to frost in cold regions (China or Tea Hybrid), it is advised to cover your rosebush (with a mound of peat 20 or 30 cm tall) you will withdraw in the spring. This precaution will be useful only for the first winter. 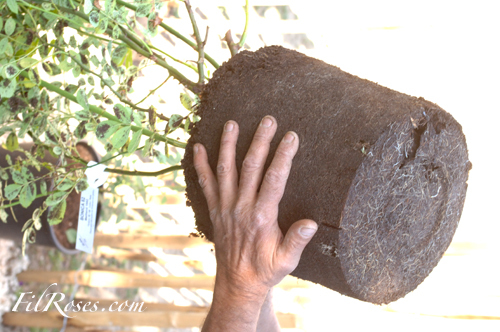 In the case of bare root roses, it will be preferable to put the roots in a bucket full of clay mud consisting of half garden soil and cow dung. If this preparation do not suits you, you always can obtain it at our Rose Garden. 1) A hole 70 cm deep and wide. 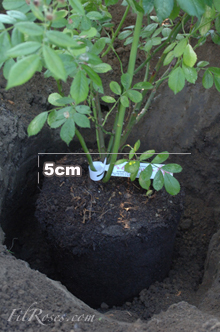 2) Put the plant on a bed of loose soil to the point of graft is buried +/- 5 centimeters below ground level. 3) Add two to three kilos of humus to the backfilling ground while ensuring that this amendment of very rich ground is not in contact with the roots (risk of burns). 4) Add a handful of bone meal or fertilizer for rose plants. 5) Settle the soil and water copiously (10 liters of water at least). If you plant in pots, preferably use broad and deep earth-en-ware pots (the size will depend on the future development of your rosebush) but do not plan to use pots less than 70 cm deep and less 45 cm wide. Drain the bottom of the pot with a bed of pebbles and prepare a mixture of 50% of garden soil with 50% of good compost, then proceed to planting as described in A or B. * Do not plant during freezing periods of or wet ground. * Do never plant a rosebush at the place of another rose plant, it will vegetate inevitably. If you are forced to do so, remove the soil to a depth of 70 cm and replace it with the earth removed from another location in the garden. Alternatively ROOTGROW (available at the Rose Garden). * Do not plant rosebushes in a ground where water stagnates long time when raining. Rosebushes enjoy a clean soil and do not like weeds. All products to weed are harmful to rose plants and I recommend you not to use them in your massive. A manual weeding with a hoe is perfect and it will be a moment where you can enjoy the fragrance of your plants. However this operation has to be done again, you might consider this as a chore. The most appropriate solution is to mulch your soil (especially avoid the bark of pine trees that are fatal to rosebushes). The ideal way is to mulch with cocoa pods, which offers many advantages; they keep your soil moist (rose plants love to have cool feet), by decomposing this waste of cocoa will be a valuable source of fertilizer, it smells chocolate, it controls the growth of weeds (you easily manage to remove those which find their way) and it is aesthetics which is not negligible. You extend a layer of 5 cm thick. At the first rains, a fine white mold appear on the surface of your mulch cocoa, this is normal, this mold is not harmful to the rose bushes and disappear at the first rays of the sun. You will need to renew the operation the following spring but over the years, the amounts will be less and less important.